Z-WAVE is used in many new home automation systems, and we are announcing our new Z-Wave group controller for bottom-up window shades, skylight shades, 12v RV motorhome shades, blackout shades, window openers and regular custom blind motors. This unit works with all our standard radio motors. Mermet® Custom Shades: Our DIY shade and blind motor kits are popular, but for those of you wanting a more complete solution, we are now offering high quality shade and blind fabrics from Mermet®, mounted on standard tubing, with hem bar. Our motors just slide in and lock in place - no fuss no muss! Please check our Custom Blinds and Shades website for info. Please Note: The Mini radio motors do not beep during the programming procedure, they only jog. These wired shade motors are designed for long term shade and blind motor operation, using a AC/DC 12v power supply and/or external backup battery. These motors also have a 3rd travel limit setting that falls between the upper and lower limit, so that you can command your shade to go to an intermediate partial open setting. Each RollerTrol™ wired radio motor has a small hole on the outside edge of the exposed cap with a short wire pair exiting the hole. This wire is for supplying the motor with 12v DC power, and polarity needs to be observed as it will not work if the wiring is reversed (although no damage will occur). There is another small open hole where there is a small switch for activating the 'programming' mode of the motor. You will need a small blade screwdriver or similar object to insert into the hole to reach the setting switch. Please Note: Some models have a rubber cap over the setting hole that just needs a finger press. The picture at right is a generic representation, and motor head design will vary slightly from model to model. If you have the TMDG-12-16-03-50-R Mini, it has a jack where the hole is, and a plug with a length of wire is provided. You can feel a pronounced tactile click when this switch is activated, when inserting a small screwdriver or similar item into the hole. You do not need to apply much pressure for this to be activated, but it is possible to miss the switch if you are using something small, like a paper clip. Further around the plastic end there is a short single wire (about 6 inches) that acts as the antenna for the radio receiver inside the tubular motor. For maximum reception, this wire should be kept away from any contact with a metal part. We provide small screw terminal adapters with every power supply. If you look carefully, you will see that they are marked with positive and negative terminals. 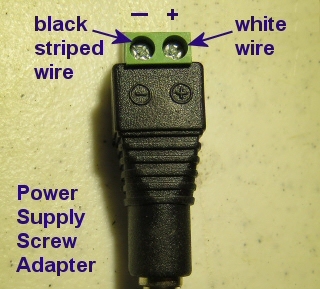 The striped wire from the motor should connect to the negative screw terminal, and the other white wire in the pair should connect to the positive terminal. You will need a small Philips (star head) screwdriver to tighten the terminal screws; we recommend that you use a small jeweler's screwdriver. Please note: If you have the DCGQ-15-RF version (pictured here), the back of the remote does not have to be removed as the P2 button is already exposed. Please see the hole in the back of the unit; you can press the setting button (referred to as P2 below) with a small screwdriver, pen, or paper clip. It does not require much pressure, and you should feel a tactile click when it is activated. These units come with batteries installed and last for years. If you need to change the battery, you can remove the back for access to the battery compartment. A slight downward pressure with your thumbs at the top while you slide it off is all that is required. 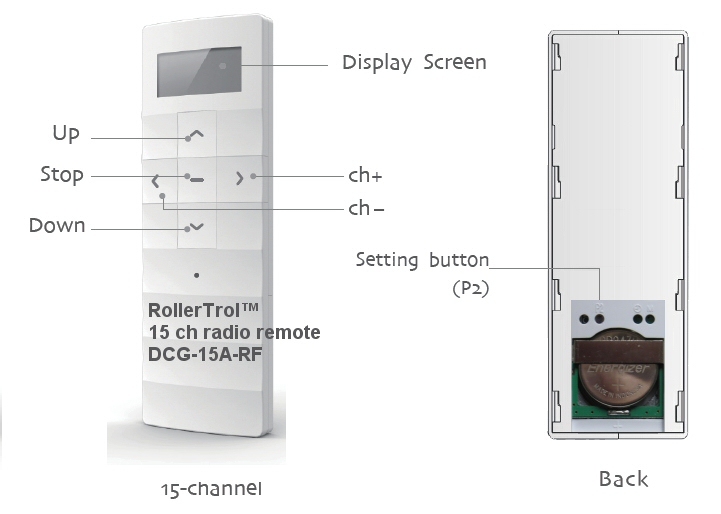 Please note: If you have the older DCG-15-RF version (pictured below), the back of the remote has to be removed as the P2 button is not exposed. Slide the back cover off the remote control. A slight downward pressure with your thumbs while you slide it off is all that is required. After removing this cover, you will see the battery compartment at the bottom of the remote. If the button battery is not installed, insert it now. Please pay attention to the battery polarity. The battery has a large plus + sign on one side (see picture below) - this should be facing up, towards you. There is a hole marked "P2" with a button inside it, similar to the one on the motor. Please familiarize yourself with the location of this switch, it is used to confirm channel assignments and other programming actions. Please ignore any other holes as they are not used for this motor. This switch also has tactile feedback, and you do not need to press very hard. Try to use something that is round and slightly smaller than the hole as it is possible to miss the switch entirely if you use a pointed object such as a pen. There are up and down indicators to the right of the LCD digital channel display that indicate the direction of travel. If you have set up your motor on some other remote control 'master', you can very simply clone the motor assignment to one or more of the channels on this remote. You would generally only need to do the full programming instructions (starting at Part 4) if you had no other remote, or if you wanted this remote to be the 'master' for some reason. It is generally considered easier to use a multi-channel hand held remote to set 'master' channels that can also control the travel limits (cloned channels cannot). Please note that cloning a channel onto another remote will not erase the travel limits set by the master. Press and release the P2 button TWICE on the MASTER REMOTE that holds the master channel you want to clone, the motor will beep once and jog each time. Make sure the new remote is set to the channel you want to clone it to, and press the P2 button (see picture). The motor will beep 7 times and jog. At this point, you are finished - the new remote will control the motor, and the travel limits will not be changed. You can push the manual buttons on the wall switch to test it. Please Note: Wait 10 seconds for programming cycle to complete before you clone another channel. Follow the exact same instructions as above, the only difference is that the motor will beep 5 times and jog to indicate channel was removed from wall switch. At this point you should have a new group of 2 motors/devices on the 2nd remote. You can repeat the process to add more. Please note: only the master can set travel limits on blind motors. Note: The following procedures require 6 seconds of pause after completion. Please wait before you try a new procedure. PLEASE SKIP THIS STEP IF YOU HAVE ALREADY ASSIGNED THIS MOTOR TO ANOTHER REMOTE THAT YOU WANT TO KEEP, OR IF YOU HAVE SET TRAVEL LIMITS WITH A DIFFERENT REMOTE, this procedure erases any previous settings. The operation is done at this point - the memory has been cleared. You can reset the memory as many times as you like, but please understand that all channel assignments will be erased. Note: All procedures require 6 seconds of pause after completion. Please wait before you try a new procedure. Each motor should be assigned to its own master channel for the purpose of setting the travel limits - this is referred to as the master channel assignment. Only the master channel channel can set the travel limits, so it is a good idea to make a note of which is the master channel. The following procedure is for setting the master channel, please see steps 10 and 11 below for adding/removing additional channels. Please Note: During the channel assignment procedure, the button presses must be completed with 6 seconds of each other, otherwise the setup procedure will 'time out', and you'll have to start over. Press the channel buttons until you see channel 1 (or desired channel assignment) displayed on the REMOTE. Hold the setting switch on the motor down for about 2 or 3 seconds. When you see the motor jog backwards and forwards slightly, release the setting button (the motor will sound 1 beep). The motor is now in programming mode and is waiting for its channel assignment. To complete the channel assignment, press the P2 'confirm' button inside the REMOTE (see above picture) within 6 seconds - the motor should beep once and jog. Then, press P2 on the REMOTE once more for final confirmation within 6 seconds - the motor will beep once (no jog). Finally, press the UP or DOWN button on the REMOTE within 6 seconds - the motor will jog, then it will beep 6 times, and this ends the programming sequence. If you pressed the UP button to complete the process (in the above step), the motor will turn clockwise (looking at axle end) when the UP button is used during normal operation. If you pressed the DOWN button to complete the process (in the above step), the motor will turn clockwise (looking at axle end) when the DOWN button is used during normal operation. Please Note: You can also change the programmed motor direction in step 7, below. At this point, the operation is complete - the motor is assigned to channel 1 (or whatever you selected). You can then use the UP/DOWN/STOP buttons on the REMOTE in its normal operating mode, and you can then try it out see where the default travel limits are set. From this point forward, you should be able to activate the motor normally any time channel 1 (or whatever channel assignment was activated) is selected on the remote control. You can also repeat this procedure for other channels on the same remote, and channels on other remotes (this is how you can have more than one remote control the same motor). You can test these motors without a remote, if they have had at least 1 channel assigned. Press and release the MOTOR setting button once, and the motor will start to turn in one direction and continue until it reaches a travel limit. Press and release it to stop. Press and release again to make it travel in the opposite direction, until it reaches the other travel limit. Press and release the setting button to stop it at any time when it is moving. The travel limits of a RollerTrol™ motor can be set and changed at any time with the master channel of a remote control; you do not have to touch the motor at all. The following procedure is how you set the travel limits with the master channel. Please Note: once you have initiated the travel limit setting mode, if you don't do anything for 2 minutes, it will time out and you'll have to start over. If you get stuck in the setting mode for some reason, you could start over by clearing the motor memory and re-assigning the channel, but this is not usually necessary. Make sure the REMOTE is set to the correct channel. Press and release the P2 button on the REMOTE (see picture above), the motor will beep once and jog. Press and release the UP button on the REMOTE, the motor will beep once and jog. Press and release the P2 button on the REMOTE again, the motor will beep 4 times and jog. At this point, you have entered the travel limit setting mode, and the 2 minute time-out rule is in effect (if you do nothing). During this process, the motor will beep every time it stops, so that you know you are still in the programming mode. Under normal operation, there is no beep when it stops. Use the UP/DOWN/STOP buttons on the REMOTE control to move your shade to the desired upper travel limit position, it will move at normal speed. Once you reach the approximate position, you can use the JOG MODE at this point for very fine positioning, by pressing the P2 button on the REMOTE once, WHILE IT IS RUNNING. This mode slows the motor down, moving it in small stepped increments (jogs), so that you can stop it exactly where you need. Pressing the P2 button on the REMOTE while it is still running will cause it to exit JOG MODE and resume normal speed. Once you have the upper position set, press the STOP button on the REMOTE 4 times. The motor will beep each time you press stop, and it will jog after the 4th press, indicating that the upper travel limit has been set. The motor is still in 'programming mode' so that you can set the lower limit (you cannot exit the programming mode until this is done). Use the UP/DOWN/STOP buttons on the REMOTE control to move your shade to the desired lower travel limit position. Once you have the lower position set, press the STOP button on the REMOTE 4 times. The motor will beep each time you press stop, and it will jog after the 4th press, indicating that the lower travel limit has been set. The motor has set the lower limit at this point, and the programming of the travel limits is complete. The motor will now be in its normal operating mode, and you should be able to see the full travel between the travel limits using the UP/DOWN buttons on the REMOTE. 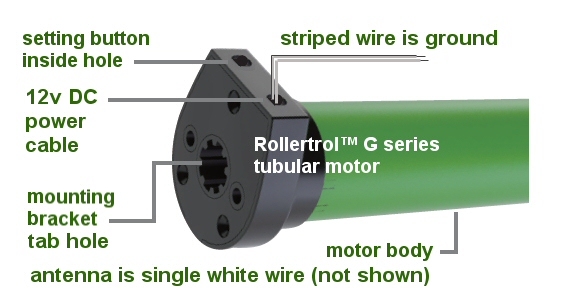 These motors have an optional 3rd position setting in between the upper and lower limit that allows you to automatically go to a partial opening position of your choosing. You can set or remove the middle position any time you like; it does not need to be done during the upper and lower travel limit settings. Use the UP/DOWN/STOP buttons on the REMOTE control to move your shade to the desired middle position. Note that there is no jog mode for setting the middle position. Press and release the STOP button on the REMOTE, the motor will beep once and jog. Press and release the STOP button on the REMOTE again, the motor will beep 3 times and jog. The motor has now set the middle limit at this point, and the programming of the travel limits is complete. The motor will now be in its normal operating mode, and you should be able to see the full travel between the travel limits using the UP/DOWN buttons on the REMOTE. If you want to move the shade to the middle position, hold the stop button down for 3 seconds (long press), then release. The motor will move to the mid position. If you just use the UP/DOWN buttons, the middle position will be ignored. The motor has now removed the middle limit at this point, and the programming of the travel limits is complete. The motor will now be in its normal operating mode, and you should be able to see the full travel between the travel limits using the UP/DOWN buttons on the REMOTE. You saw in the above steps how to use JOG MODE for fine positioning when setting the travel limits. You can also operate these motors normally in jog mode whereby a single press of the UP or DOWN button on the remote control causes it to move a very small increment, just a fraction of a degree. This can be useful in applications where a very small amount of movement is desirable, such as adjusting Venetian blinds or other slatted shades. Press and release the DOWN button on the REMOTE again, the motor will beep 2 times and jog. To exit jog mode, repeat the above procedure and the motor will revert to its normal operating mode, and you should be able to see the full travel between the travel limits using the UP/DOWN buttons on the REMOTE. The process is the same for all motors in the group, but each one will normally be assigned to a different master channel (although you CAN assign multiple motors to the same channel later, once the master channel has been established, see step 10). Once the travel limits have been set, they will be observed for each individual motor, even when activated simultaneously in Group Mode with the ALL button or by some other channel on the same remote or a different remote. As a convenience, your shade motors can 'grouped' onto a single channel simply by assigning the motor to the same channel. You can also assign the motor to any other channel on any series G remote control, using the following procedure. It is entirely up to you how you do this. Keep in mind that channel zero is automatically programmed as the ALL channel, as you assign motors. Press and release the P2 button TWICE on the REMOTE (see picture above) that holds the master channel, the motor will beep once and jog each time. Switch to the channel you want to assign the motor to on the same REMOTE, or pick up another remote and make sure it is set to the channel you want to add. Press and release the P2 button ONCE on WHICHEVER REMOTE is being assigned, the motor will beep 7 times and jog. At this point, you are finished - the new channel assignment will control the motor, and the travel limits will not be changed. This feature is very useful for dual shade systems, for instance, where you may have daytime semi-transparent shades and another set for night time blackout. See our motorized remote control dual shade article for more information. Each motor can store up to 20 different channels in the on-board non-volatile flash memory. If these motors are powered by an external battery of some kind, such as a marine or RV deep cycle battery, they will have no dependency on grid power, and they will still function in the event of power failure. Switch to the channel you want to delete the motor from on the same REMOTE, or pick up another remote and make sure it is set to the channel you want to remove. If it is a single channel remote, there is nothing to change as it only has one channel. Press and release the P2 button ONCE on WHICHEVER REMOTE is being deleted, the motor will beep 5 times and jog. At this point, you are finished - the channel assignment will be deleted from the motor, and the travel limits will not be changed. You can assign a motor to more than one remote control; the motors can 'learn' the bit pattern of any channel on more than one remote. Please see the previous step 10. With the Z-wave interface and Vera™, you can later extend control of your window blind radio motors to any browser on your web enabled devices (PC, phone, tablet, etc). VeraLite is a full blown home automation systems - and the most user-friendly.